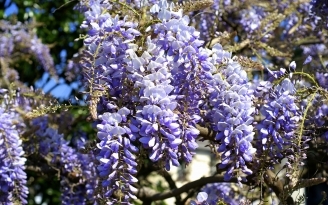 Elly was never keen to have her photo taken, so a picture of wisteria, like that on the front of their cottage, hopefully, will be a reminder of her. Elly who lived at 2 The Green for many years, was not able to fight her cancer any more and died at the end of January. She is greatly missed by her husband Paul, daughter Gemma, son Toby, the 5 grandchildren and other family and friends. Elly had a Humanist send off at the Crematorium. There was standing room only and it was a very moving ceremony with her favourite music being played. A very brave and articulate friend, they had been friends since starting work together, spoke about Elly in a positive yet humorous way. Elly loved her garden, and was always happy upside down in a herbaceous border, consequently her send off was surrounded by flowers from her friends and family. Touchingly, those present were offered a small bag of bulbs to plant in her memory. Afternoon tea was served back at the house. The WI ladies had made the cakes and served the tea. Elly was very fond of her tea, taken black! Elly was born and spent her formative years in Southampton, she attended Art School and went on to be a window dresser at Peter Jones in London. Her artistic talents were used to good effect as she made celebration cakes as a living as well as making all her own cards etc. She told me once she had also tried all the seasonal jobs in the village, hop, apple and strawberry picking, which was something she could do when her children were young. On retirement, she used her skills by teaching the WI ladies many different crafts. Elly could see the potential in what we would consider junk. Her garden is very interesting and imaginative. Most of us would have thrown the artefacts, she used to good effect, away as junk. Even the garden sheds were painted up to look like beach huts. Elly looked out for her neighbours and was a helper at Evergreens. No one can make a Lemon Drizzle like Ellies. Light but very lemony. She will leave a hole in village life that will be difficult to fill.